I went into Five Nights At Freddy’s: Sister Location feeling skeptical. The last FNAF game made some changes to the formula, but the whole shtick felt kind of worn. This time, however, developer Scott Cawthon has some new tricks up his sleeve. You can watch me go through the first couple of days in the video above, where I was joined by Highlight Reel’s Chris Person. The game is out now on Steam for $6.79, at a 15% discount for launch. To give you some background: In Sister Location, you play as Mike the janitor, who for some god forsaken reason has decided to return to a haunted pizza parlor stocked with murderous animatronics. Like before, your goal is to survive as many nights as you can. 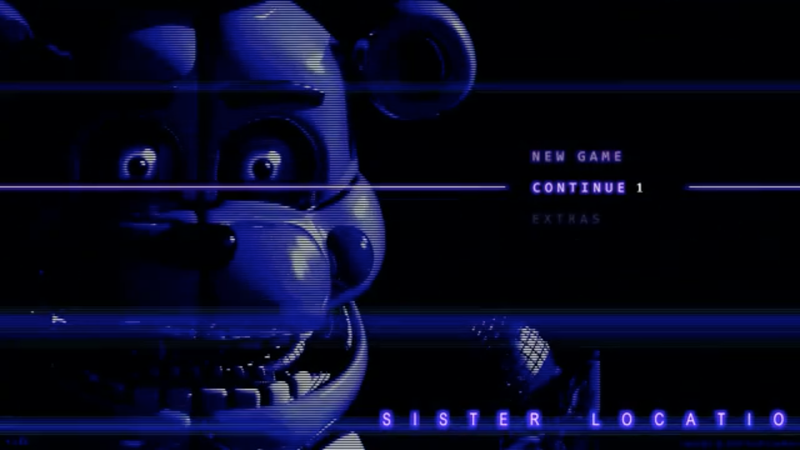 One thing that’s different about Sister Location: it feels like more of a guided experience. Older games have featured a guide of sorts doling out bits and pieces of the story, but this time, you get dialogue and instructions throughout your first couple of nights. For once, I didn’t feel totally lost while playing, because the game actually told me more or less how the mechanics worked. Don’t take this to mean Sister Location is easier; I still died in the first couple of nights. I just wasn’t completely clueless as to why. Most of all, though, Sister Location feels like Scott Cawthon’s most ambitious game yet. In the first couple of days, I visited a number of different areas, all with different things to see and do. This FNAF is not just screen management. You will walk around, hoping to avoid detection from a violent ballerina. You will fight against a murderous robot baby. You’ll restore power to different areas. You will play some old-school mini games. You’ll watch TV and eat popcorn (!) Oh, and you’ll be crawling through lots of vents too. There’s a button to eat popcorn. GOTY 2016. What Sister Location excels at is suspense. I kept expecting a jump scare to happen, just by virtue of it being a FNAF game, and while there are still plenty in there, they weren’t the only things that built tension. As you play, you have two different narrators telling you contradictory things, which is great for building paranoia. Judging by the threads online, people are already hard at work trying to figure out Sister Location’s place in the overall lore, and it sounds as twisted as you’d expect. Something about an animatronic inside another animatronic? And dead co-workers? I await the upcoming Game Theory tying it all together. I haven’t finished Sister Location, but for once I’m looking forward to jumping back in and experiencing more.